I’ve actually had this tasting in notepad form for a couple of weeks now and have finally had a chance amidst the jetsetting life of a RadioShack sales associate and being swept away into the suspended disbelief of nerddom, i.e., video games and movies, to write it down. I’ll preface this review with a bit of history as to how this particular beer came to be, and if I do say so myself, it’s rather intriguing and heartwarming. Collaboration beers aren’t really anything new in the craft beer community; in fact breweries tend to enjoy “keeping it all in the family” when trying to come up with interesting concoctions. Dogfish Head and Sierra Nevada aren’t strangers to this practice and have mixed it up with countless other breweries to create some truly unique brews. That being said, their Life and Limb series, consisting of two beers so far, definitely succeeds in making a truly wonderful beer. 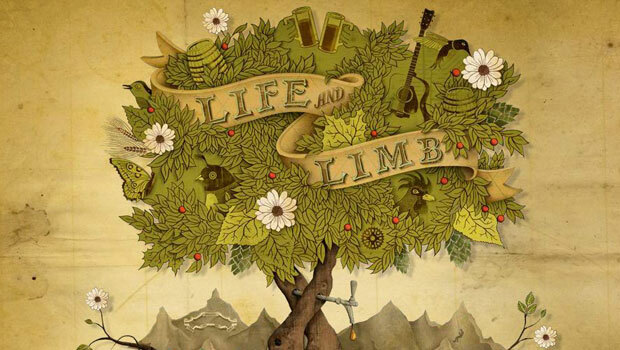 The story behind the creation of the first Life and Limb beer is rather warm and fuzzy. Both breweries are family-owned and operated and have an extended family of coworkers that share the same closeness despite their lack of blood relation. The two breweries wanted to celebrate their shared familial beer bonds with the world by creating a beer that would represent those very special connections and show their appreciation for the breweries and the beer enthusiasts that make up the craft beer family tree. The beer was so popular that it sold out in two weeks, so they decided to release it again with the same recipe but a different package to rejoice the fact that craft beer is still alive and kicking. From their website they describe what the two words Life and Limb mean when it comes to the ingredients of this delicious alcoholic potion. Life: This beer is naturally carbonated to enhance complexity, refinement, and shelf-life; the family of yeast cells in every bottle working in vibrant unison. Limb: The two syrups used in making this beer (maple and birch) contribute to its unique and earthy flavor and symbolize the collaboration between Sierra Nevada and Dogfish Head. All the ways this beer was made illuminate the importance of family and friends and how those networks help to create some truly amazing things. Now with the history of this beer behind us, we move on to the tasting, which I thoroughly enjoyed. Pouring the color of maple syrup, this beer is absolutely gorgeous with a small yet retentive head, and as it hits the glass my nose is treated to hints of that maple and birch syrup marriage. Robust malts drift into the nostrils as roasted coffee rounds out an intriguing mixture of smells. The taste mirrors its scent-sense compatriot as taste buds will undoubtedly pick up that sweet syrup flavor and coffee aftertaste. This beer is incredibly complex though surprisingly easy to drink, and given its 10.2 ABV it’ll leave you feeling light on your feet. It comes in a 750 ml bottle, so I was overjoyed in knowing I had another glass of it left to drink. In the second tasting the robustness is more pronounced and the flavors are more intense as candied sugars imbue already overloaded taste buds with more sweetness. This is definitely a beer to be enjoyed and patiently sipped because of its changing flavors and enjoyably complex taste. I definitely enjoyed this beer, and I recommend it to anyone looking for something different that exhibits a variety of delights for the senses. I don’t know if I have the power to give it a score, but if I did I’d give it 4 bottle caps out of 5! Drink happily, my friends! Drinking this right now! Review is spot on … it’s one delicious beer.